1. 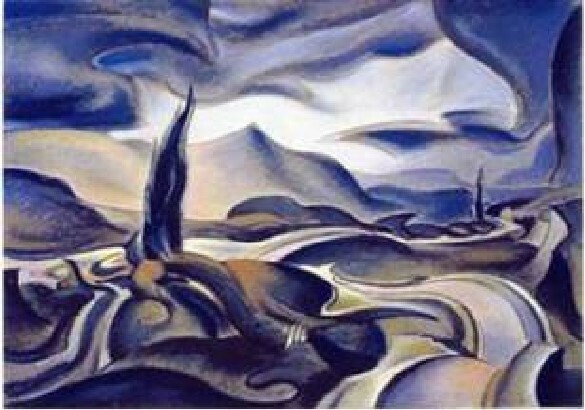 "Shepherd Landscape". 1929 - 1945. Oil on canvas. 24 x 36 inches. K170.00. Private Collection. TO CHART the life's work of an artist on one website page is a challenge. If that artist was active over a period of forty years, the clearest way to show how his work evolved may be to select just four or five groups of typical works produced at key stages of his development. Largeness of concept, precision of form and depth of space are characteristic qualities of almost everything RMS produced, including many small and apparently casual sketches. 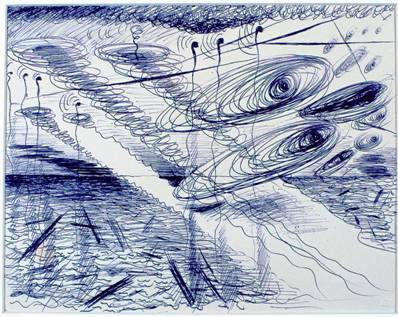 These drawings are his answer to an apparently endless flow of ideas, only a small portion of which he was able to develop, but which show him to have been a prolific artist. 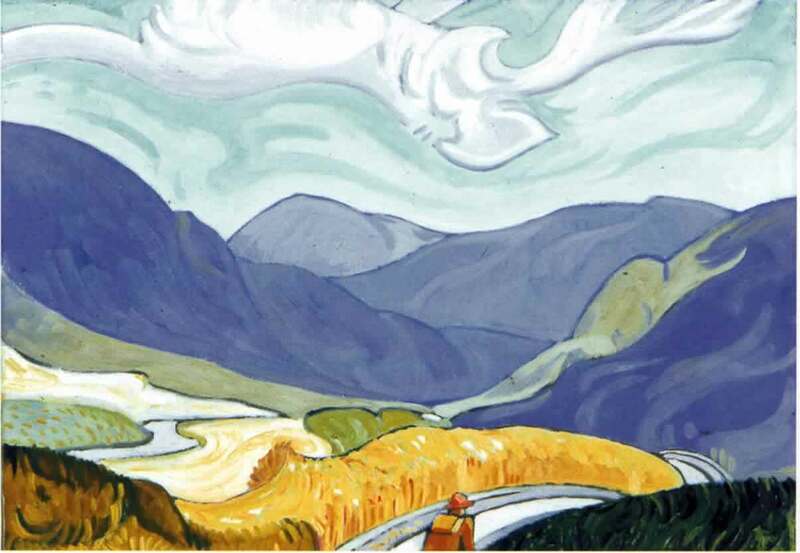 Although he was successful in producing larger oil paintings like "Shepherd Landscape" and "Circles and Moon", the limitations imposed by his lifestyle meant that such achievements became increasingly rare as time went on. 11. 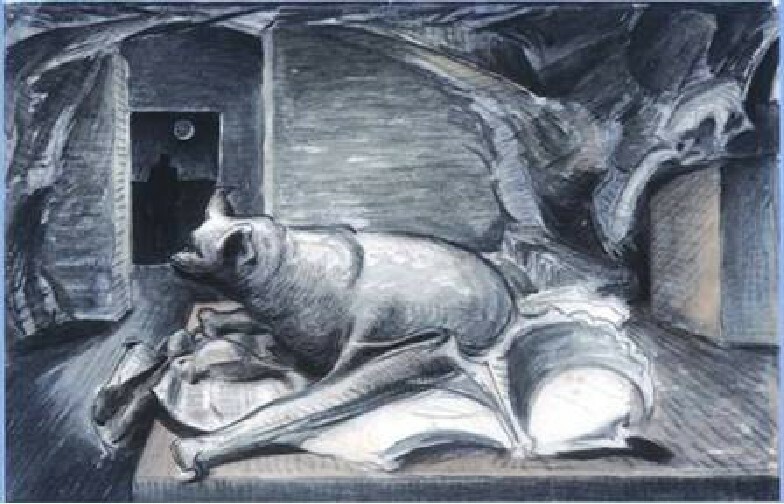 "Interior with Bat". 1947. Watercolour with charcoal. 14 x 21.25 inches. K933.00. RMS Trust Collection 12. "Better Be Yourself, Better Make Your Own Music". 1948. Watercolour with charcoal. 14.5 x 21.75 inches. K1010.00. Collection British Museum. 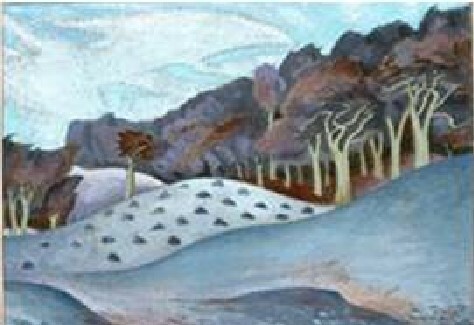 DURING the early and middle period of the war, Maynard Smith produced a series of lyrical English landscapes, more consistently ‘pastoral’ in character than any group of subjects he had worked on before. He seems to have been motivated by the desire to evoke an idyll of the land to be protected against a violent enemy. Throughout his work as a whole there are very few attempts at direct representation of the War, and the few sketches that there are seem hesitant. 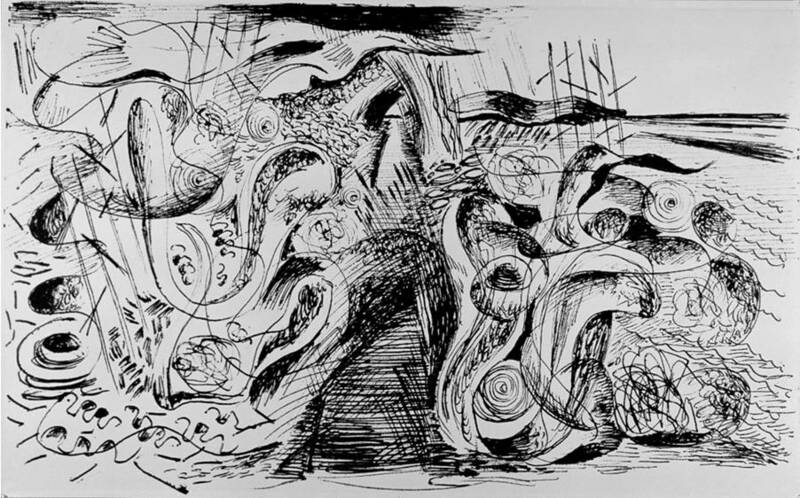 The sometimes violent ‘war of the elements’ he increasingly recorded with expressive gestural techniques, signified rather the internal struggle of men within themselves. And after 1945, when it was over, he was not optimistic that it had been the war to end wars . 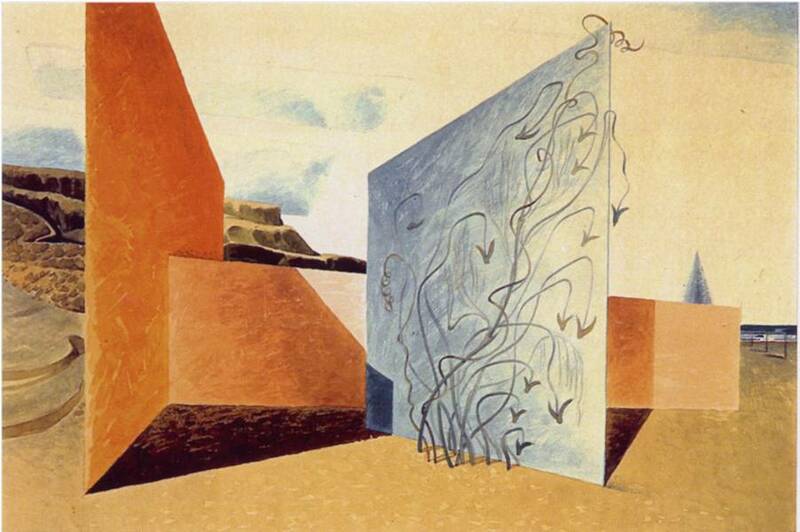 THE 1946 painting “Free Is the Prospect Here” is significant, not only in itself, but because it heralded the mature phase of his work. 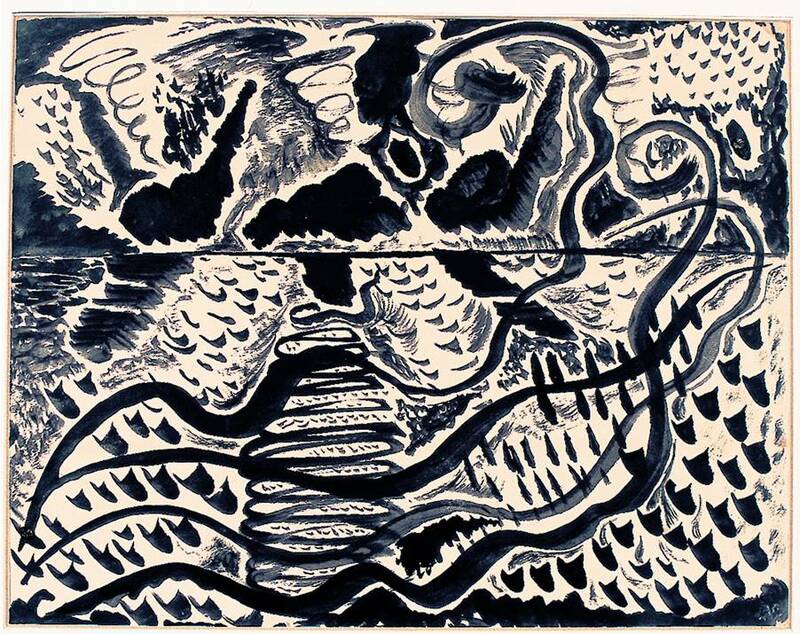 In 1949 he used the title again, for a large manuscript book containing 65 drawings and watercolours, in which, with numerous twists and turns, he explored all the pictorial avenues made possible by the breakthrough that that painting represented. 14. “Vertical Surfaces on a Beach”. 1951. Watercolour. 15 x 22 inches. K.1296.00. Private Collection. THE DRAWINGS in Maynard Smith’s manuscript book “Free Is the Prospect Here” provide the key to his middle period and later work. 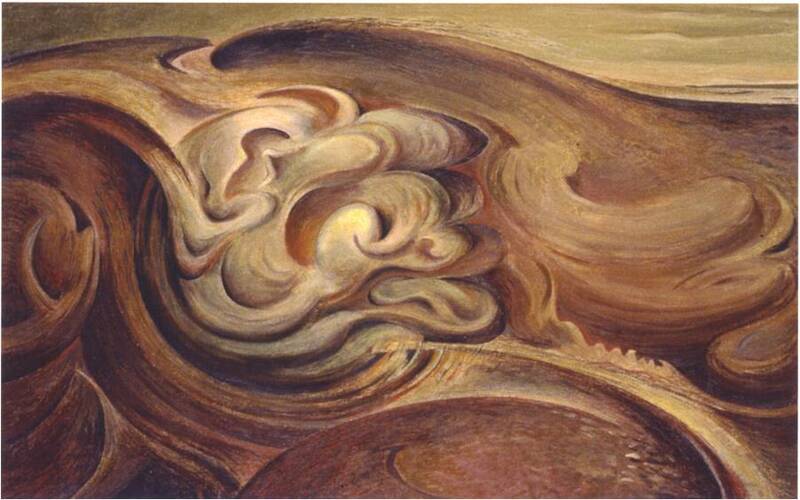 Some of his paintings from the late 1940s and early 1950s, such as “Eclipse of the Winged Embryo”, “Vertical Surfaces on a Beach” and “Circles and Moon” convey a sense of calm contemplation. It was as if he was aware that he had reached the territory for which he had been searching. 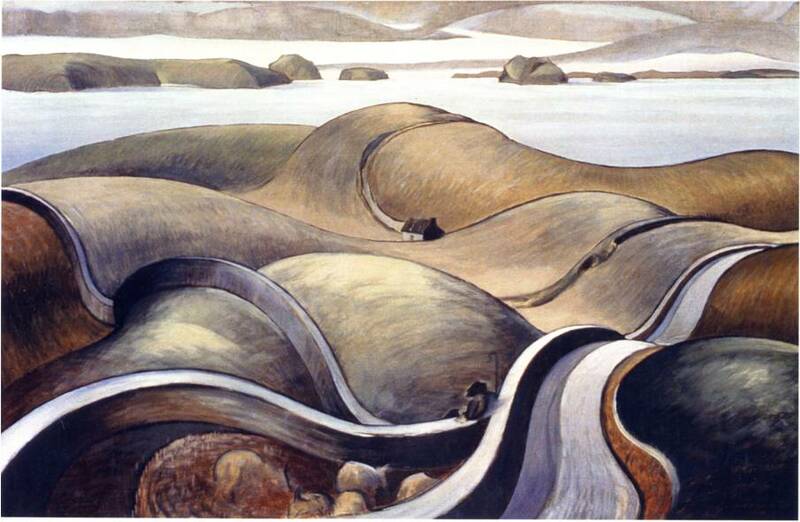 Those paintings group together to form a new idyll, of images both lyric and surreal at the same time. 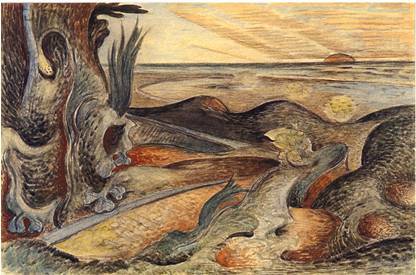 Following these, a small number of watercolours and drawings were titled “Districts of My Kingdom”. 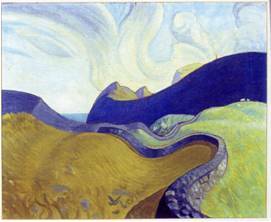 These draw our attention to his imaginary world and its topography, which he had culled from natural topography. Walking through this land of the imagination, he was like some early cartographer, sketchbook in hand, recording its salient features for the first time. 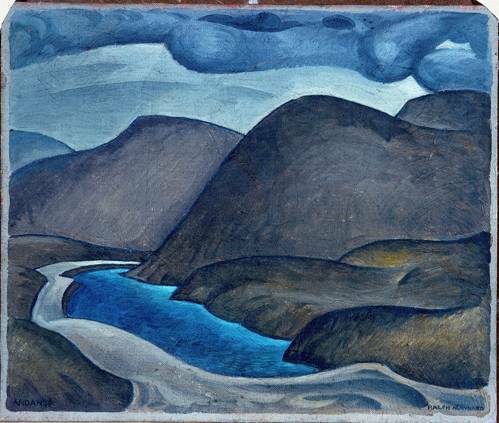 IN “Wordless Urges” he encounters a more dangerous place, and as the years progressed the land he was exploring became sometimes more threatening still—mountainous areas where hurricane force winds raged and seas were threatened by great storms. About this time he wrote: “The things which are most real to me are the illusions which I create. Everything else is a quicksand.”. 17. ‘Memories Field Blown Bare, Hurricane’. 1953. Pen with blue & brown inks. 5.125 x 8 inches. K.1368.00. RMS Trust Collection. 19. ‘Canal by the Shoreline’. 1956. Pen & ink. 5.375” x 8.875”. K1443.00. Private Collection This is the 1963- 4. ‘Photomural’ version from the original drawing, as approved by the artist. 21 x 35 inches. RMS Trust Collection. 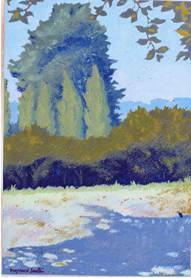 IN EVERY PHASE of his progress as a painter, RMS would occasionally produce a work, whether sketch or considered drawing, which provided a glimpse of his future development. 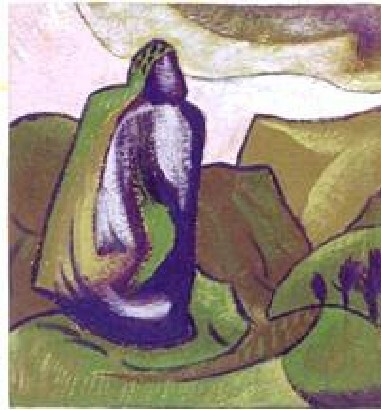 The painting “Pebble Hollow” from 1947 was one of these. 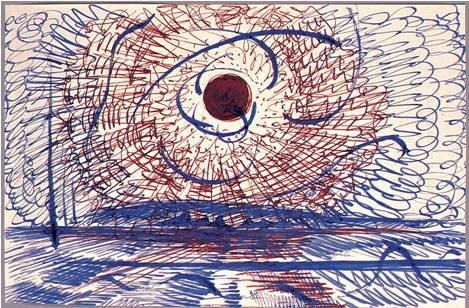 Both its tonality and its gestural directness of touch prefigure his growing interest in the importance of mark-making: the speed and manner in which the line was drawn, expressing the emotion of the moment. Sometimes the pen digs deep into the paper, sometimes it lingers gently. 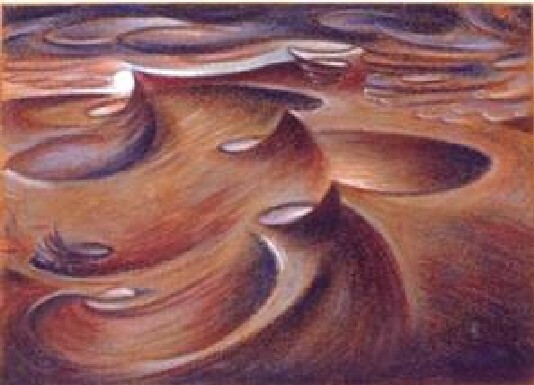 “Pebble Hollow” stands well with this group of later drawings, in which variations on the theme “Memories Field” keep appearing. ’Spatial abstracts’ numbers 17,18,19: three of more than 100 which stand alone in British Art of the period. EVEN in the 1920s RMS was concerned that each composition should have not only its own tonal mood or ‘key’ but also its own internal momentum or tempo. 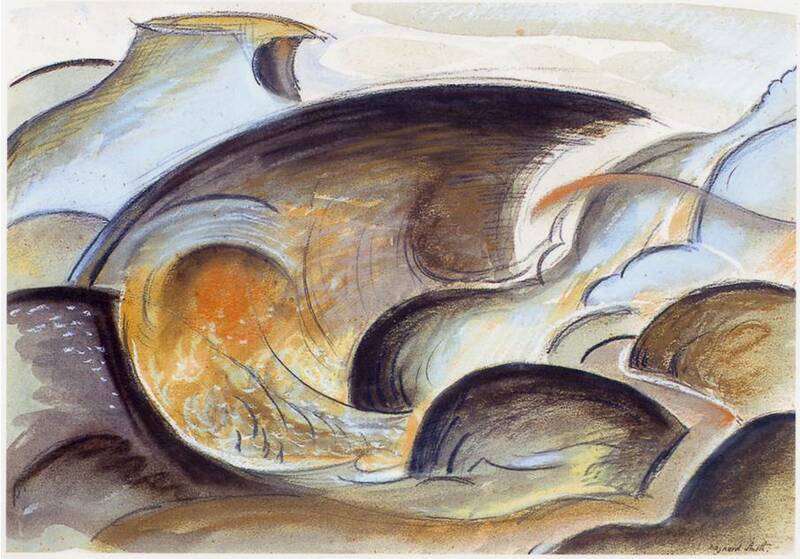 Some of his titles highlight this, such as “Andante”, “Hand in Hand with the Musician”, “Prelude to Storm” and “Final Movement”, all of which underline his belief that pictorial composition should share with music the freedom to abandon imitation in favour of creation. 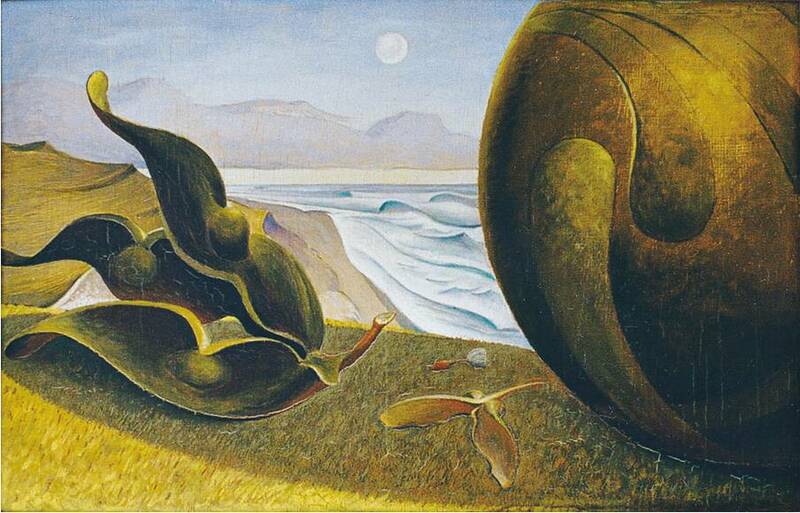 It would be difficult to find a painter more aware of the tempo or pace of each composition, as for example how the andante movement of “Vertical Surfaces on a Beach” gives way to the allegro of “Memories Field Blown Bare: Hurricane”. Maynard Smith’s evident experience of synaesthesia, and the effect of music on his painting generally, seem to echo those same influences affecting the work of Kandinsky and other painters of the 20th century, although RMS’s manner of expressing it was very different.